I have recently started doing quad skating at the age of 49. and I am wondering what to expect over the next months. Long ago, when I was 16-18 I was doing some inline skating, and I always liked doing that. When I became 20-22 my interest for skating disappeared. But 3 years ago I picked up inline skating again. First SUV inline skating, then inline skating. I had one serious fall in February 2015 and I broke my hip. Despite wearing all protective gear. A DHS Dynamic Hip Screw was placed and 12 weeks later I was on my skates agin. Now here is the interesting bit: I own 10-15 pair of inline skates in all shapes & sizes: smaller wheels, larger wheels (125 mm), high cuff boots, low speed cuff skates. All to have the different challenge to try and manage them. 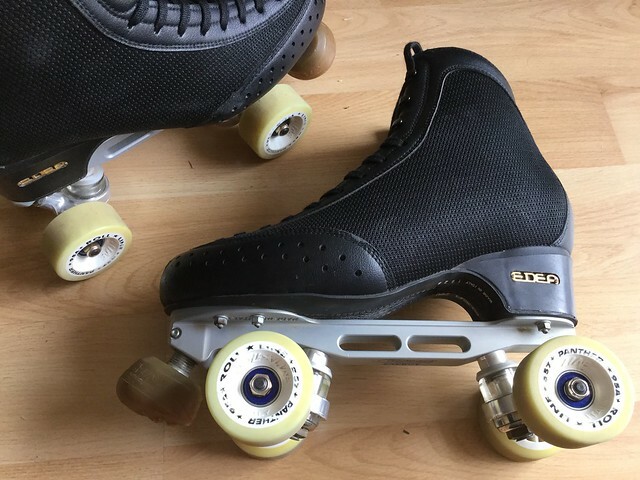 But I also bought some quad artistic rollerskates, all second hand (Roll-line Mariner Cup with Risport boot), and recently a very nice pair of Edea Fly with Roll-line Energy Steel plate. Some of the easier moves, I learned by myself a bit: forward cross-overs left/right, reverse skating, etc but now with the training, I am wondering how far I will get with this Artistic rollerskating. What should my targets be for the next 4-6 months, 1 year. I would love to be able to perform at least a single jump one day, and some pirouttes. No camel spins (yet) ! LOL ! anybody experience with starting artistic rollerskating at that late age? probably some sore muscles from ones u don't normally use. freestyle is possible but be careful for injurys. your not old as some starting off believe it or not. pay attention to your coach and learn from watching and don't push it. one step at a time. good luck, you have good equipment to start with. I am just trying to learn basic skating skills(started at age 56, now age 58) but if time and opportunity continue may keep working on higher level skills but definitely no jumping! Absolutely master edges, inside/outside, forward/backward, clockwise/counterclockwise. You cannot overdo it. Take frequent lessons as proper form is everything. Have a plan. I have been skating for months but have modified my approach in these two ways. Have changed from no plan and taking a lesson when I think I am ready to a detailed 3-phase plan and frequent lessons, at minimum every other week. Now when I get to the rink I have a practice plan to guide me and maybe more importantly to challenge me. Glad you have good equipment as I started with a basic package that held me back initially; mostly because I did not want to spend a lot of money until I was sure that I would stick with it. What to expect over the next 4-6 months? Or a year? Over the next 4-6 months you will learn 2-foot jump, 2-foot half jump, mohawk jump, waltz-jump, half mapes, full mapes, half flip, 2-foot spin and beginnings of a 1-foot spin. Before the 12-month mark you'll be learning salchow and flip jumps and the harder spins like OF and OB upright. You'll learn Glide Waltz and Progressive Tango in dance and figures 1/1b, 2/2b, 111/111b, 112/112b. If your rink has proficiency test you should plan on taking Freestyle 1 and 2, dance 1 and figure test 1 and 2 at the 6-month mark. Shoot for dance 2, figure 3 and Freestyle 3 at 12-months or so. You'll start feeling really confident....and then it will happen. You'll take that one fall and start questioning yourself. Don't. Everyone takes that one fall. It means you are learning and progressing. Wear padding if it will help with the confidence. I still wear elbow pads and a hip pad when I feel like trying hard stuff. Take the dance classes. You're legs will get stronger from it. Take the figure classes too. You'll learn better edge control. Most important, have fun. When it's not fun it's time to find a new activity. Now that is a nice write-up and thanks for that ! and indeed, I always wear protective hip pads and write pads, as I just want to have that bit of extra confidence. Hardly anybody else wears these. And falling I still do even when inline skating, after 5000 km in 3 years. It just happens, and there is nothing you can do against this. Just get up and learn from it. I started just trying art stuff at 49.You're lucky to have access to lesson. I don't so, as for art, I'm pretty much a hack. I do pretty good mohawks. I can put my feet front or back so the heel wheels are all lined up. Just getting to the point where it's more of a foot replacement than put your feet down turn the go. I can do 5 out 8 three turns ( pretty slopily) an IB spin (which I would love to do better, but I get three turns, and a waltz jump. I can do a 360 but it's pretty much scratch, I wouldn't give it a name. I don't do an axel on skates. I can arabesque quite well, changing postions arebesque while gliding is easy for me. Kicking and dancing in this posiotion came pretty natural. Spread eagle I'm good at. I got the back edge with my ankles together as well as front. I'd like to tighten that circle though. I side surf better than anyone I know. I can do either foot forward in either direction of travel. Though this was never a goal for me, it just happened to come naturally. Right now I'm working on back crosses and back cross-overs. I can do cross-pulls really well. I got in with some jam skaters, so I do toe-toe spins. Glide on my toes forward and back switching front feet. Can't do the grapevine yet. I may spin down to the floor and spin on my back a bit and pose (as if I did something great) just for laughs. Stand on my head. I do quite a good off-skate roundoff or cartwheel. Haven't got that one to skates yet (no toe stops so that make it tough. I hate toe stops). My goal at 49 was a camel spin. I once thought I was getting close, but I'm not really. But that quest for the next thing keeps me going. It is so fun . So starting at 49, no problem, as long as your having fun, go for it. There will be injuries though. I'm jealous of your formal training. But I may not be able to play by the rules anyway. I'd really love to tighten up my 3 turns and do them at full speed though. I like the look of a well done one foot turn. Good to see another future Artistic Skater! That is a very good question. You already know how to skate and are a long distance marathon skater already, but Artistic Skating is different and will pose some challenges. My pro once told me he could tell a skater who skated outside and one who grew up skating inside a rolling rink/the difference. I think the outside skaters is a little more wild and wider in their skating and an indoor skater is much more conservative and controlled in their movements, largely because you will have people at your sides more often than when you skate outdoors and you have the whole wide open yonder to skate around…lol! Many “Artistic” Skaters skated in their youth, come back and it really don’t take long to get back into the groove of things. I’m one of those skaters at 62 years old. But if you never skated artistic figures, dance and freestyle as a youth, I would think that would be an exceptional challenge to learn and get good at 50 years old. The steps and mechanics are not the hard part. The hard part is the style. If you look at a ice skater on TV, and forget about the jumps and spins, they have so much, grace and speed and elegance In their skating. That is a hard thing to learn at 50 years old. I would think it would take 2-3 years to get good at it. To get that look. The mechanics you could learn in a year. But for most artistic skaters the dream is to compete and win and that means developing that style and elegance and beauty as you skate across the ice pond or roller skating floor. I would be amazed if you took you first dance in a year and if you took the 1st and 2nd dance after a year, you have what it takes. Thanks Larry for this information & background. And I do recognise te 'wild' bit that you mention. Long distance skating is of course less technical, brute force, and just keep on pounding and keep that heart-rate up ! Especially in more autumn conditions, when there is a lot of wind, it becomes a good work-out. And actually what you are saying is indeed correct, and I noticed that already the first 2 lessons: I am going into these lessons way way to fast, pounding at it like I would do long distance skating LOL ! So tomorrow is the next lesson, and I am gonna do it all very very very slow and concentrate on the technique. Competing ? no way ! that is not the plan. That being said: the club organises a yearly show end of November, where all 150 members take part, from 5-6 year old starters till .. I don't know what age. Not this year, but next year, it should be the plan to do a small *something* during that show. So the target for the first year: do at least some small jumping. And we will see. It is just for the fun, not for the competition. Thanks for all the feedback above, appreciated ! Thanks Larry for this information & background. And I do recognise the 'wild' bit that you mention. Long distance skating is of course less technical, brute force, and just keep on pounding and keep that heart-rate up ! Especially in more autumn conditions, when there is a lot of wind, it becomes a good work-out. The show is 3 times : 2 times on Saturday , 1 time on Sunday. To show the parents & family what everybody has learned. Not this year, but next year, it should be the plan to do a small *something* during that show. Just to prove that it is possible to learn. So the target for the first year: learn steps & technique and do at least some small jumping. And we will see. It is just for the fun, not for the competition. Last edited by gd11_be; September 18th, 2017 at 04:32 PM. These are my recently bought second hand 'new' skates. Bought them for less than 1/2 normal price from a site in Italy. Really love skating in these. Now did a couple of training sessions already and even after 2 1/2 hours skating, these skates still feel very very comfortable ! A second hand shop in Italy.